I know, I now…it’s so NOT Friday but the day…no actually the entire week, got away from me. While my heart loves cooking and cocktail making and blogging about it, I still have some demands from my web business that take precedence and this was the week that was. Six words. ‘Host is going out of business.’ Oh yippee…now trying to move several sites before a ridiculous deadline so while I needed a drink…I had no time to make one! I hope I make it up for all of us with this Apple Ciderfest Cocktail. I’m all about the apple right now and this cocktail has them in spades. Apple Cider. Applejack Brandy. Hard Cider. Oh and some vodka for good measure. Of course! While I typically would turn to a darker liquor to mix with an apple concoction, the vodka in this was fantastic. It gave it an edge but kept it lighter which was perfect as I wanted to differentiate it from other favorites I’ve concocted; most notably this Bourbon and Apple Cider Cocktail. If you’re like me and not really into cocktails with eyeballs floating in them for Halloween; this is another great seasonal drink that would be welcome for any Fall bash. I’m fortunate to be offered a wide variety of cocktail products to try but until recently had never heard from the folks at Ketel One. Which was sad because it’s always been my favorite mixer (I’m not the straight up type; never will be). It is a smooth no frills vodka with a price tag that belies the quality I’ve found. It is simply one of the cleanest vodkas I’ve tried and while some think it a shame to mix it into a cocktail; for me it’s perfect. I want a good product, not a cheap one that would ruin my concoctions without breaking the bank in the process. The Ketel One company thrives on the legacy of the Nolet family of Dutch distillers, which are now in the 10th generation, and this family legacy is unusual in the big names of vodka. Their two flavored vodkas (Citroen and Oranje) are also favorites as they’ve taken a light hand with the flavor. I like a good flavored vodka with flavors that have always worked in vodka. I don’t like ones that hit you over the head with some awful sugary sweet mix. Yes, I’m thinking Cake Vodka. Gets a big EWWW from me! If you have either of the flavors on hand, I think they would work equally well with this lineup; I would have loved to try it with orange but I was all out. Sad face. What I will try it with? This Pumpkin Spice Popcorn I posted earlier this week. Perfect with an apple based cocktail. Have you noticed that your favorite watering hole is now serving cocktails over large spheres or squares of ice? It’s not just for looks either. The larger pieces have less surface area than all those little pieces combined and as a result they melt slower. Up to ten times slower! Perfect for a sipping cocktail like this when slower is better. The forms I used for the ice balls in this post are from Arctic Chill. Water is simply poured into the small hole on the top after the top and bottom are secured together and then is placed in the refrigerator for the water to freeze. 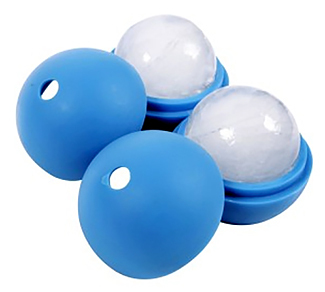 The bottom of the form is flat so it’s easy to find a spot for it and voila…round ice ball! My first try I filled them to the brim and the top was pushed up a bit and the ball formed a rim around the center. I was unhappy but guess what? It melted so quickly I should not have worried about it. They really are a fun addition to your bar and your cocktail making activities! The sample I received included four (4) forms; that’s a nice number because planning for a party means making several. I want to try making them next with some juice; I’ve even heard you can do that and use them in a punchbowl. You will definitely see them in more cocktails! By the way, I have a good friend who often comes over when I’m in the cocktail making mode. She commented yesterday that she has had more cocktails that she would have never thought of trying before and has surprised herself even with how much she loves them. In particular some favorites I’ve shared with her that include bourbon. I think I know the secret behind her change of heart. Taking a light hand with the booze! I try to make a good cocktail, not one to leave you staggering out the door after two of them. That means finding a good ratio for the alcohol and the other ingredients. Don’t make the mistake I think too many bars do and throw an extra measure in thinking it will turn your patrons friends into undying fans. This cocktail is a great example. I first tried it with just the vodka, Applejack and hard cider and it wasn’t until I included some fresh apple cider that it really came together they way I had envisioned. Sometimes less really is more. Cheers! Mix the vodka, apple brandy and apple cider together in a small pitcher and chill for 1 hour. Pour over ice or an ice ball and fill the glass 2/3 full. Top off with the hard cider and stir. I made this in a pitcher for a crowd. If you need a smaller amount, simply measure 1 part each of the vodka, apple brandy and apple cider with 1.5 parts hard cider. This post was sponsored by Ketel One Vodka however all commentary is my own. You’re so right that you don’t want to screw around with ratios in cocktails! Unbalanced drinks just aren’t fun. But there’s everything fun about this drink! The vodka is interesting, but when you say it works, I believe you (you know your stuff). Sorry about your web host — I’ve wondered for a bit about how viable a business that is. I can see us ending up with just a handful of monster hosting companies. Anyway, good post — thanks. Web hosts going out of business is not good news. Can’t imagine someone not taking it over. Cake vodka? Just sounds gross to me but this apple ciderfest is a definite winner!